The only photography I've done in Kentucy (as of early 2019) is the city of Louisville, taken from the Indiana side of the Ohio River. Perhaps one day I'll get a chance to spend more time here. In the fall of 2019, I did a quick tour of Eastern states and midwest cities, in an attempt to diversify my photography portfolio. Louisville, shown here, is quite a beautiful city, especially when viewed from the Indiana side of the Ohio River. The John F. Kennedy Memorial Bridge is visible on the bottom of the photo. Available in the following sizes (Rectangle B): 12x8, 18x12, 24x16, 30x20, 36x24, 45x30, 60x40, 72x48. In the fall of 2019, I did a quick tour of Eastern states and midwest cities, in an attempt to diversify my photography portfolio. 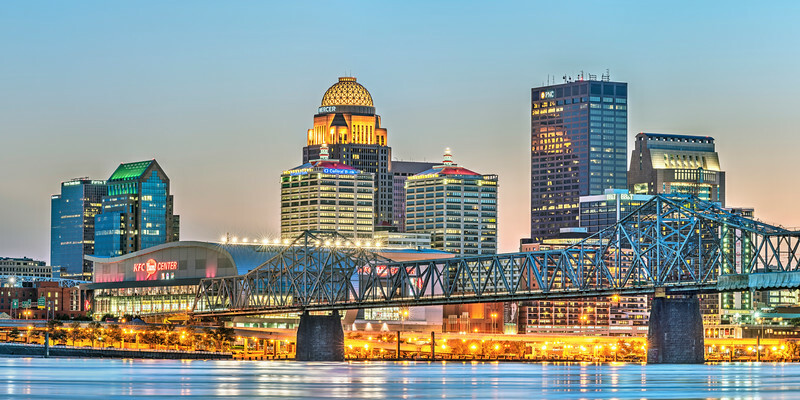 Louisville, shown here, is quite a beautiful city, especially when viewed from the Indiana side of the Ohio River. The John F. Kennedy Memorial Bridge is visible on the bottom of the photo. Available in the following sizes (Panorama C): 30x10, 36x12, 48x16, 48x16 Triptych (3 x 16x16), 60x20, 60x20 Triptych (3 x 20x20), 72x24, 72x24 Triptych (3 x 24x24), 90x30, 90x30 Triptych (3 x 30x30), 108x36 Triptych (3 x 36x36), 126x42 Triptych (3 x 42x42), 144x48 Triptych (3 x 48x48).